To learn more about the Tarheel 3-Gun Challenge and monthly matches visit Bushmaster.com or Tarheel3gun.com. Tarheel 3-Gun is now in its fourth year of holding organized 3-Gun matches. 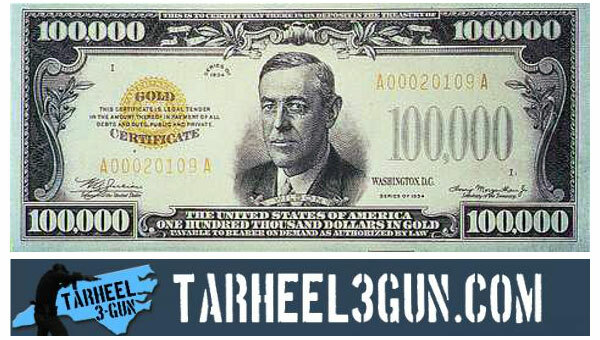 Bushmaster sponsors the monthly series as well as the Tarheel 3-Gun Challenge. Share the post "250 Shooters Compete for $100,000 at Tarheel 3-Gun Challenge"
Lotus Gunworks of Jensen Beach, FL, has built a vast “double-decker” indoor shooting range featuring a two-story-high steel funnel bullet trap. Nicknamed the Lotus 8/11 for the number of steel panels used to create it (eight panels on the bottom slope and 11 panels on the top slope), this version of Action Target’s Total Containment Trap is the first of its kind. “No one has ever seen a range like this before*,” Lotus Gunworks’ Director of Operations Robbie Abell said. “We’re truly making industry history.” The official range Grand Opening is slated for next weekend, April 19-21 2013. Why build a two-story gun range? Abell came up with the concept when it became clear that the new Lotus building in Jensen Beach was not wide enough for two side-by-side ranges AND a gun store. Necessity was the mother of invention… Lotus wanted at least two ranges, so the only option was to make a double-decker range where both levels shot into the same bullet trap. The double-decker range required clever engineering. Bullet-trap maker Action Target “Super-Sized” its Total Containment Trap, scaling up the system from 8 feet high to a whopping 19 feet high. Then steel cross beams were fitted to support a Mancom Touch ‘N’ Go target retriever system. 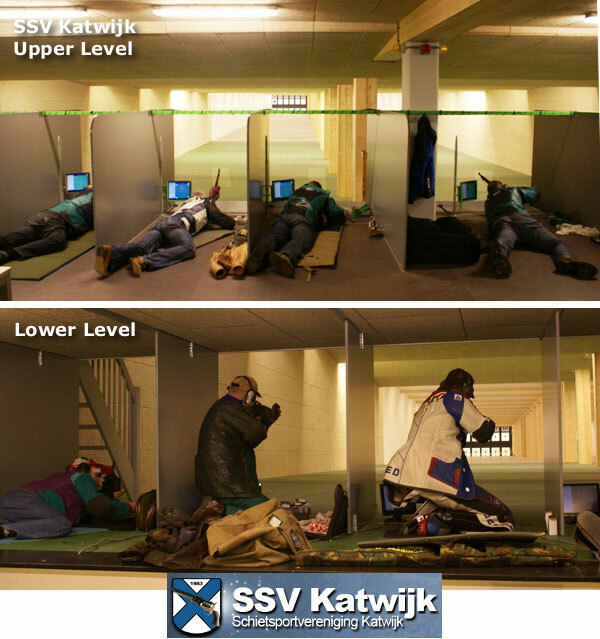 Indoor ranges require ventilation to remove potentially hazardous dust and lead particles. The sheer size of the double-decker range presented a unique challenge, but Carey’s Small Arms Range Ventilation installed a system that can completely replace all the range air every 80 seconds. The old air is drawn out, and replaced with fresh filtered and refrigerated air. “The air flow in the upper level was the best I have seen on any range, and the airflow on the bottom was also very good,” said Carey’s technician Mark Hanson. 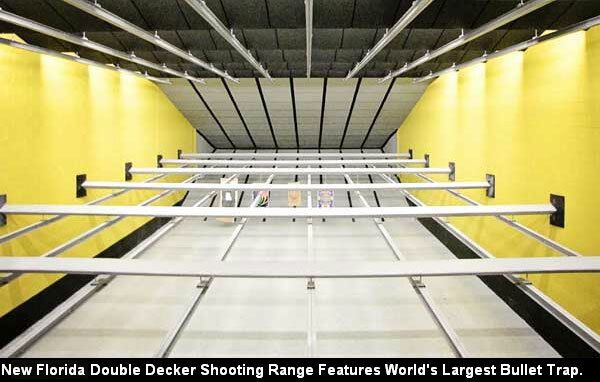 Share the post "Double-Decker Indoor Range with World’s Biggest Bullet Trap"
Hunters and tactical shooters need scopes with good low-light performance. For a scope to perform well at dawn and dusk, it needs good light transmission, plus a reasonably large exit pupil to make maximum use of your eye’s light processing abilty. * And generally speaking, the bigger the front objective, the better the low-light performance, other factors being equal. Given these basic principles, how can we quickly evaluate the low-light performance of different makes and models of scopes? 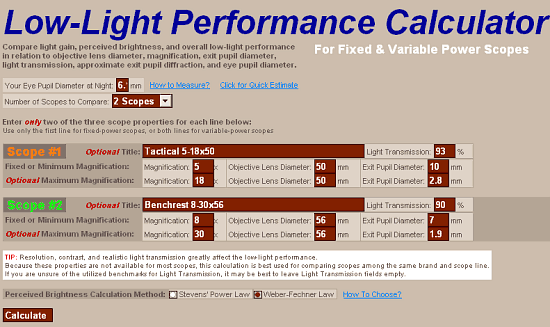 Here’s the answer: ScopeCalc.com offers a FREE web-based Low-Light Performance Calculator that lets you compare the light gain, perceived brightness, and overall low-light performance of various optics. Using this scope comparison tool is pretty easy — just input the magnification, objective diameter, exit pupil size, and light transmission ratio. If the scope’s manufacturer doesn’t publish an exit pupil size, then divide the objective diameter in millimeters by the magnification level. 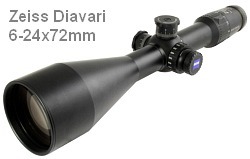 For example a 20-power scope with a 40mm objective should have a 2mm exit pupil. For most premium scopes, light transmission rates are typically 90% or better (averaged across the visible spectrum). However, not many manufacturers publish this data, so you may have to dig a little. ScopeCalc.com’s calculator can be used for a single scope, a pair of scopes, or multiple scopes. 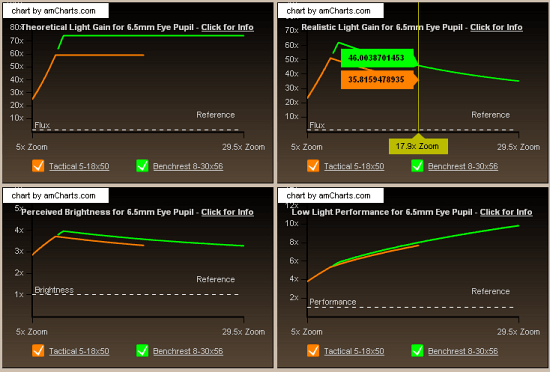 Once you’ve typed in the needed data, click “Calculate” and the program will produce comparison charts showing Light Gain, Perceived Brightness, and Low-Light Performance. In the example below, we compared a “generic” 5-18×50 Tactical scope with a “generic” 8-32 Benchrest scope. Though the program is easy to use, and quickly generates comparative data, assessing scope brightness, as perceived by the human eye, is not a simple matter. You’ll want to read the annotations that appear below the generated charts. For example, ScopeCalc’s creators explain that: “Perceived brightness is calculated as the cube root of the light gain, which is the basis for modern computer color space brightness scaling.” In addition, the way ScopeCalc measures Low-Light Performance is pretty sophisticated: “Low Light Performance [is calculated] as the average of light gain and resolution gain through magnification, as a measure of target image acuity gain in low light similar to Twilight Performance specified by scope manufacturers. Low Light Performance calculated here is much more useful than Twilight Performance, as Twilight performance is the average of the just the objective lens diameter times magnification, while Low Light Performance is the average of the actual Perceived Brightness times magnification, which also includes the exit pupil/eye pupil relation, light transmission, approximated diffraction, as well as the perception of relative light gain. Just as with Twilight Performance, this Low Light Performance calculation does not yet include lens resolution and contrast as factors. Therefore lower quality optics will yield relatively less gains at higher magnifications.” Got that? *In low light, the human eye can typically dilate to 5mm – 7mm. The exact amount of dilation varies with the individual, and typically declines, with increasing age, from 7mm (at age 20) to a dark-adapted pupil of about 5.5mm by age 65. To take full advantage of a scope’s light-gathering capacity, the diameter of an eyepiece exit pupil should be no larger than the max diameter of your eye’s dark-adapted pupil, so that all of the light collected by the scope enters your eye, rather than falling on the iris. A large 8mm exit pupil may seem good, but it would be partly “wasted” on a shooter in his 60s. Share the post "Gauge Low-Light Scope Performance with ScopeCalc.com"